This is a sale for a brand new genuine Honda Civic CRX Del Sol Integra Type R B16A B16B B18C Countershaft 3rd Gear from Honda Motors, Japan. 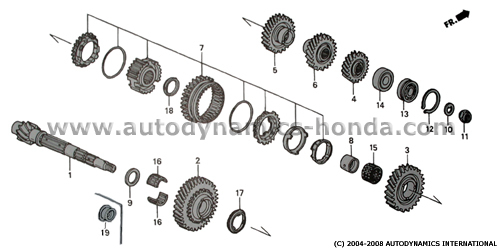 The countershaft 3rd gear is No.5 in the B-series DOHC VTEC hydraulic transmission countershaft components diagram below. As application is very wide, buyers please check that this part number countershaft 3rd gear matches with your requirements. Buyers may also check with us if uncertain of application.